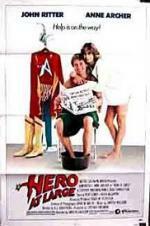 Buy or Rent Hero at Large (1980) Movie DVD & BluRay Online! Movie Plot: An idealistic but struggling actor finds his life unexpectedly complicated when he stops a robbery while wearing the costume of Captain Avenger, a superhero character of a film he is hired to to promote. He decides to dabble at being a superhero only to find that it is more difficult and dangerous than he ever imagined.